The first thing I saw when I woke up was a horrifying number of mosquitoes clinging to the outside of my tent door. I closed my eyes, hoping that I would go back to sleep and wake up later to discover that it had just been a dream. (Nope – horrible.) I made the mistake of twisting my head around for a 360º view of the tent and came to the conclusion that we were in big trouble and needed a really efficient exit strategy. Once Andrea was awake, we packed everything up as best we could inside the tent, threw everything out of the doors, crawled out, collapsed the tent, gathered everything together in a couple of heaps, and once again fled to the beach. Waiting inside the rainfly, where they benefited from the heat inside our tent instead of dying out in the cold like nature intended. We dropped everything in the spot where we made lunch the day before and took in our surroundings. The fog that had rolled in the night before had not left, and visibility was very limited. The cliff immediately to the west was a vague shadow. We had put our rain jackets on because it was actually very chilly, and it had seemed like it was raining in the woods. Because they had been absorbing the mist in the air all night from the fog, the trees dripped water overhead from their needles and leaves, giving the illusion of a steady light rain. We made oatmeal and talked about the day ahead. This is the most picturesque section of Pictured Rocks National Lakeshore. The cliff views between Chapel and Mosquito beaches are spectacular, and hikers are able to walk out onto the tops of a couple of the more impressive formations. The fog was a factor we had not anticipated, however. The sky was murky, and there was no sign of the sun working its way through. If the fog did not burn away, there were not going to be many views of any kind. Still, Andrea and I have spent time in this area in the past when fog has been a factor. Fog creates an atmosphere that is just as enjoyable as a clear sunny day. In fact, it enhances the moody aura of Lake Superior. 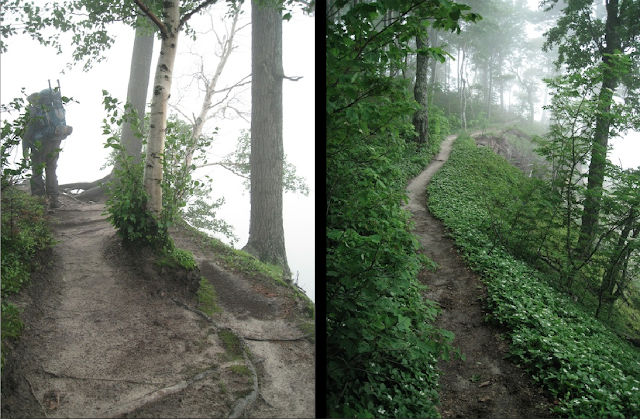 Since we have both hiked this trail before on a clear sunny day, hiking it in the fog would be an interesting twist. Plus, unpredictable weather goes with the territory, so you have to just go with it. I did feel bad for the hikers we would end up seeing that day who had probably traveled there to have their first Pictured Rocks experience and were not able to see any of the cliffs. That is a shame. After breakfast, we finished packing and hit the trail just before 11:00 am. Despite the fog - which never lifted - it was great hiking weather. It remained chilly all day, and we never removed our rain jackets. From the trail, nearly all of the cliff views were completely obscured, but it was still a fun hike. Fog enveloped everything and floated among the trees in the woods, giving the forest a mystical look in some areas near the cliff edges. Sadly, we could not see Grand Portal Point or Indian Head from the trail, but we spent quite a bit of time at each place, as it is possible to walk out onto the tops of them. 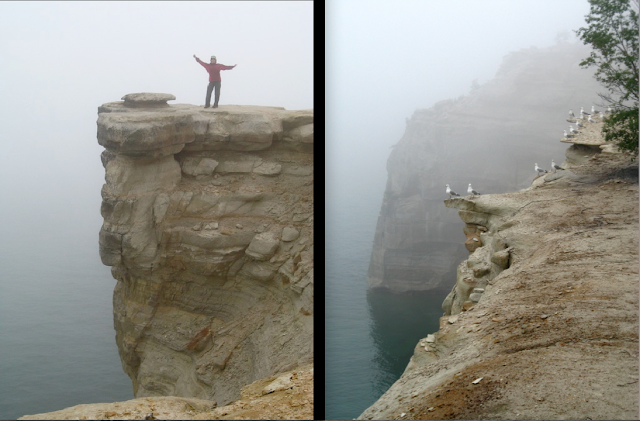 Because of these vantage points, we were able to see some of the cliffs immediately around these formations. The air was busy with sea gulls, and their calls were a constant barrage of noise that echoed against the tall rock faces. From the top of Indian Head, we watched three kayakers far below paddle close to the cliffs. There were no other boats on the water that we noticed all day; the Pictured Rocks Cruises must have had to cancel their tours due to lack of visibility. Not once did we hear any horns out on the water. 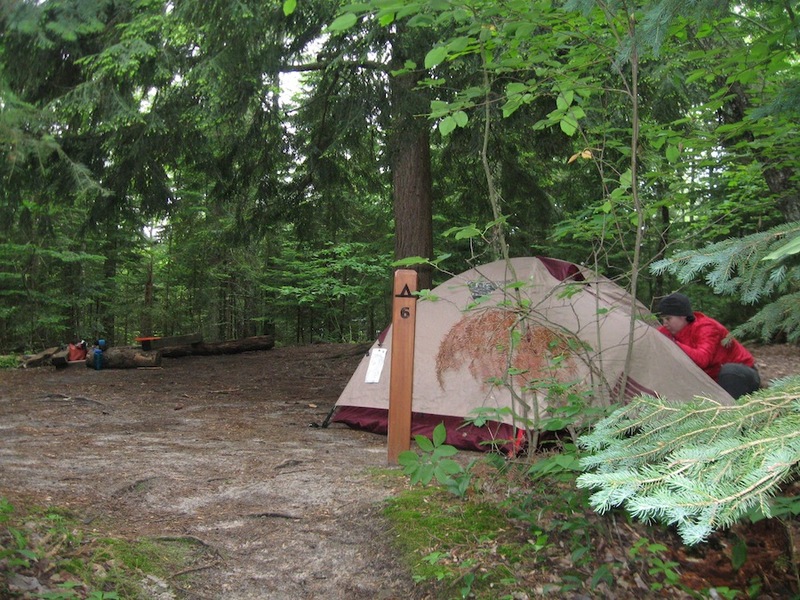 We arrived at Mosquito Campground after an enjoyable four miles and chose site #6, which has a large evergreen in the center that provides a canopy over almost the whole site. The sites in this area are all set near Mosquito River, whose mouth is at the west end of Mosquito Beach. Ironically, mosquitoes were not much of an issue here, possibly because the weather had cooled off so much. We set up camp in a normal, relaxed, non-DEFCON 1 manner, and made a quick trip to the beach for water. We collected water from the river mouth, which was easy thanks to rock shelves that create small cascades. We returned to our campsite to filter water and eat a relaxing lunch of whole grain crackers with peanut butter and cheese. After lunch, we explored Mosquito Beach for a couple of hours. This is one of my favorite spots within the lakeshore. 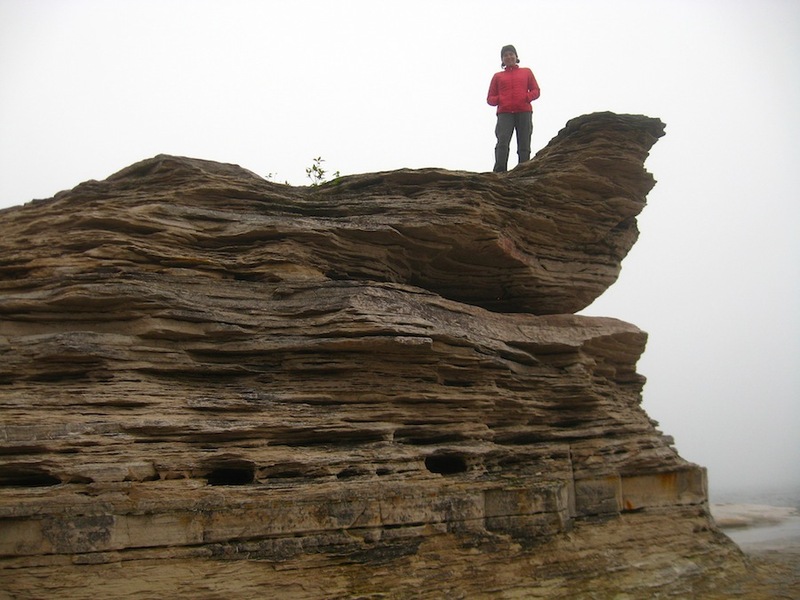 It is a rocky beach made up of layer upon layer of sandstone. 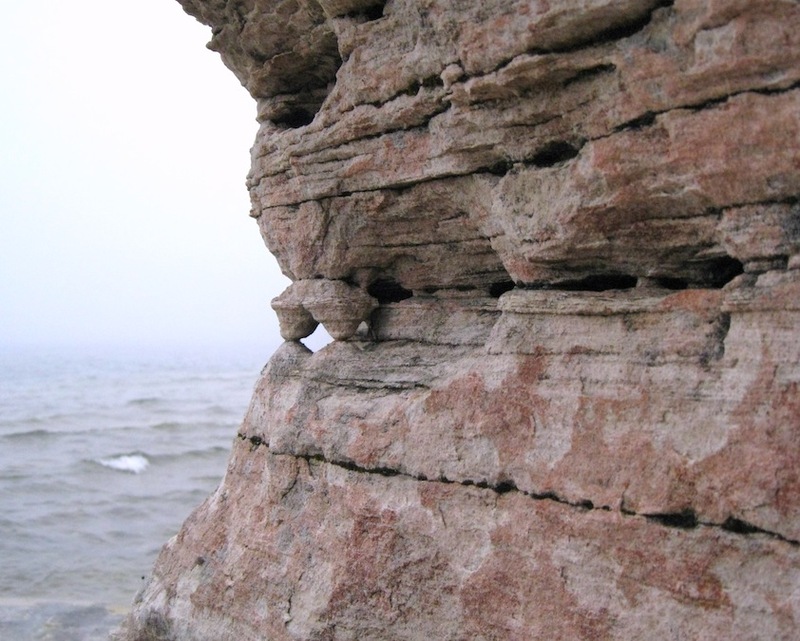 The layers are various colors at different spots along the beach – grey, brown, orange, yellow, green, and pink. Erosive elements – water, wind, and ice – have shaped and carved the stone over millennia. Andrea and I were enthralled and spent close to two hours carefully crawling all over the rock and taking pictures of everything. I could have permanently moved into a particular spot where a cove has been eroded into the sandstone, exposing hundreds of multi-colored layers. As we worked our way west toward the mouth of Mosquito River, I met a couple from a suburb north of Detroit who were playing cards on the beach to avoid mosquitoes. They asked me what we were taking pictures of and I didn't know what to say. Looking around, wouldn't the answer be obvious? We are photographing every inch of rock everywhere – doesn't everyone do that? Inside a cove. I want to live here. I was trying to come up with something to say other than “rocks,” to answer this insane question, but then I looked up and saw that they were both looking at me like I was crazy, and the beach was no place for nerds. Clearly, we were not going to understand each other, so I mumbled, “Oh, you know...the rock formations are pretty cool, so...rocks.” They replied, “Oh,” exchanged a glance, and resumed playing cards. Maybe they had a bad experience with rocks earlier in life and prefer not to acknowledge them. Red and brown, then suddenly green and grey. How is that not fascinating? Further east on the beach, the sandstone is suddenly pink. Even though the mosquitoes weren't bothersome back at our campsite, we decided to eat dinner on the beach because we wanted to spend as much time there as possible. We returned to our campsite, grabbed the food and cooking supplies, and returned to find the beach deserted at 8:15 pm. We descended to a wide, flat expanse of rock just out of reach of the lapping waves and fired up the Jetboil. Once again, the Emberlit went unused. We could have collected sticks, but neither of us really felt like it at this point. Black Bean Tamale Pie from Backpacker's Pantry made an excellent dinner, and we sat there for about an hour watching the surf and just being there. Moments like that are some of the best while backpacking. I like to take notes and photograph the things that I see while hiking, but sometimes just sitting in one spot and being part of it without doing anything is the best way to spend time. The fog still hung in the air, and it was breezy and chilly as we sat on the rock and watched Lake Superior continuously reach out to us along the rocky shore. If it takes mosquito bites and sore muscles to get there, it is often worth it. We reluctantly left Mosquito Beach around 9:15, found a spot away from camp to clean our dishes, and secured our food (bear pole and locker provided here also). We went to bed at 10:15 at the end of a great day. Undoubtedly, the fog was unfortunate for those hiking here for the first time, but we enjoyed it. To be continued in: Day 3 - Mosquito Beach back to the Trailhead. I would feel bad for people who were on their only visit ever with that fog, but as someone who has been to Pictured Rocks a lot, they're really magical shots! "Maybe they had a bad experience with rocks earlier in life and prefer not to acknowledge them." This made me laugh! I think one of the things I enjoy about the outdoors is that there is something for everyone to enjoy.